New York City’s many incredible museums aren’t just great to visit on rainy days, especially with The Met utilizing rooftop space to feature exhibits this summer and fall. From May 14th through November 3rd, The Metropolitan Museum of Art will present a collection entitled, The Roof Garden Commission: Imran Qureshi. Utilizing the abundant space within the Iris and B. Gerald Cantor Roof Garden, the exhibit features the works of Qureshi, a Pakistani artist known for his unique style, which often blends Islamic artistic techniques with contemporary approaches, always resulting in deeply symbolic paintings. 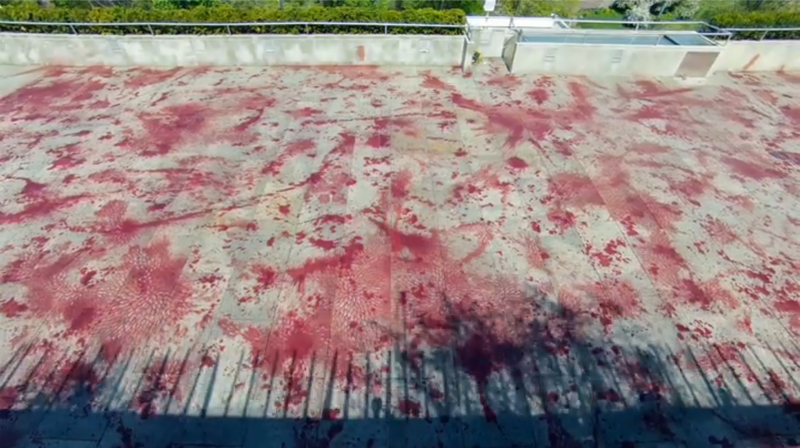 Qureshi’s rooftop art reflects on the current state of violence in the world. This installation will span the 8,000 square feet of the beautiful outdoor space, the contrast of his paintings marrying delightfully with the flora of the garden, as well as with the backdrop of Central Park. Indeed, you can feel good about visiting the Met this summer on a beautiful day because you’ll still be able to soak up some sunshine while enjoying Qureshi’s provocative works. In a recent press release, the Metropolitan Museum of Art explained that “‘The Roof Garden Commission: Imran Qureshi’ represents the artist’s emotional response to violence occurring across the globe in recent decades and his earnest hope for regeneration and lasting peace in the aftermath of man-made disasters.” The exhibit, like much of Imran Qureshi’s work, is greatly intellectually provocative and visually stunning. It has a bold point of view regarding the current state of violence in the world, though its visual commentary isn’t so palpable as to prevent its audience from drawing their own conclusions about the art. What makes this exhibit especially unique is Qureshi’s technique of splattering red acrylic paint throughout the series. He is now the first artist to create a piece that will be painted directly onto the roof’s surface, making the exhibit all the more special. This technique brings an interactive element to the collection, as visitors will be encouraged to walk on the painted surfaces as they view Qureshi’s other paintings. For more information on this exhibit and others at the Met this summer, visit the museum’s official website.